After the astonishing effects of using a regular overnight exfoliant (see my Liquid Gold review and my ‘skincare secrets’ video) I decided that I would try out all manner of different brighteners and chemical ‘resurfacers’. 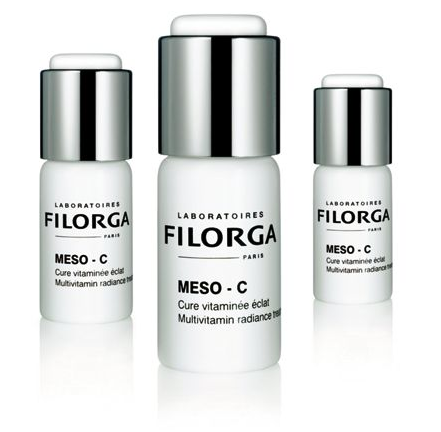 There are so many out there, so it is taking me a while, but the ‘serum du jour’ is Filorga’s Meso-C. You will see Filorga mentioned quite a lot in the Summer Skincare Video – they’re a brand that’s not very easily available in the UK (except online at House of Fraser or in the Apothecary at selected branches), but in France they are a top-selling, well-respected skincare laboratory. Their research is in specialist aesthetic medicine and cosmetic surgery, so it’s no surprise that the skincare is very hi-tech and high-performance. It’s the kind of skincare, to put it bluntly, that you really need to read the instructions for. Meso-C is a 21-day intensive vitamin C treatment. There are three vials (one for each week) and once a vial has been opened (concentrated powder mixed with the liquid, lid replaced with pipette) it must be stored in the fridge to keep the serum stable and effective. Every morning, after cleansing, the (nice and cool!) serum is applied to face and neck. At night-time, normal service is resumed and you can use whatever it is that you’re into. Unless you have very sensitive skin, in which case it’s not advised to also use an overnight peel or exfoliant of any kind. (See the dangers of over-exfoliation!) This intensive dose of vitamin C is supposed to fight wrinkles, even out the complexion and boost cellular activity. Vitamin C is a powerful antioxidant, so I suppose you’d expect to see an overall increase in brightness and clarity too..
Do you know, I have only done eleven days and I’m in awe of the results? The little dark patch on my cheek (from where I squeezed a spot in May, tut-tut!) has almost completely faded! My skin looks as though it has had some kind of soft-focus powder dusted across it – it’s somehow paler and more luminous. The overnight glycolic no doubt has something to do with these results too, but I’ve been using some form of glycolic exfoliant since May and so I know that the Meso-C is having its own effect. And I’m only on day eleven! Of course I shall report back after 21 days (although it seems that there’s enough serum to last twice that amount of time) but…so far so good! For those who have been asking for a great product for brightening skin and taking down dark spots, this could be your answer. It’s not cheap – £60.50 – but you only need to do this 21-day routine once or twice a year. (And I reckon you could get away with only using two vials in 21-days, thus always having one left over…you catch my drift?) Make sure you use an SPF if you’re going out into the big wide world, as the Meso-C is kick-starting cell-renewal and bringing new cells to the surface faster. Protect the new cells, or it’s all pointless!